New Health & Weight Loss Merchants - Plus Upcoming Events! Valley Medical Weight Loss offers everything you need for safe, quick weight loss with affordable, physician-supervised programs, FDA-approved medications, weight loss supplements, B12 injections, lipotropic injections, meal plans and nutritional counseling. Only $26.95 per week! Members of The Employee Network receive their first week free, $50 off HCG, AND 3 FREE lipotropic injections with any 10 pack purchase. No contract, no appointments, no hassles! By combining chiropractic medicine with physiotherapy and massage therapy, BackFit Health + Spine helps to restore the body's function and balance through proper spinal alignment, core strengthening and healthy lifestyle changes. Employee Network members receive a discounted price for a 1-hour massage, which also includes a complimentary chiropractic exam and X-rays if necessary. 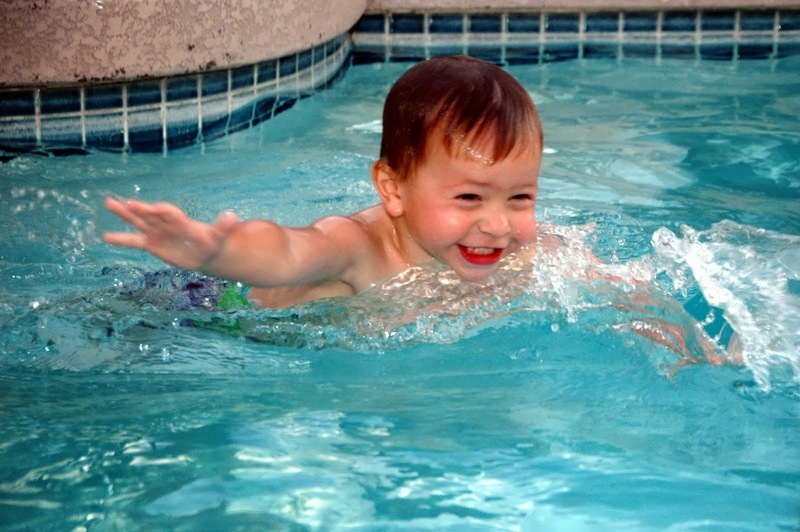 March 1, 9:00 a.m. to 2:00 p.m. - Blake’s Miracle Carnival at Swim Kids USA. Blake's Miracle foundation is for hospitalized and terminally ill children. Come support a great cause! March 2, 9:00 a.m. to 4:00 p.m. - Phoenix Zoo Zoo-cademy Awards. With more than 1,400 residents, the Phoenix Zoo is featuring some its star animals with fun awards, like Best Song and Best Nest-Building. Event is included in general admission. March 4, 7:00 p.m. - Phoenix Suns vs LA Clippers. Employee Network members, get your hard tickets 2-for-1, 25% off. Ongoing EVERY weekend until the end of March - We have Arizona Renaissance Festival hard tickets cheaper than ANYWHERE else. We have discounted e-tickets available for Employee Network members too (including children's tickets). Brand New Merchants - Fitness, Debt Management & Auto Dealers. Title Boxing Club offers "hit-free" high-impact fitness sessions of kickboxing or boxing for people of all experience levels. Experience a full-body workout and burn up to 1000 calories in one Power Hour session! Members receive 15% off your club card membership PLUS a waived enrollment fee ($150 Value!) Club memberships are customized to fit your needs and vary in length and style. They include unlimited access to the club and unlimited classes. Lose weight, strengthen core and relieve stress at Title Boxing Club. Consolidated Credit Debt Management is a life-changing service that offers a FREE consultation to Employee Network members. Setup fees are also waived if you request debt management services, where they analyze your financial debt and help you lower your interest rates and total monthly payments significantly. This is a good service to utilize around tax season! 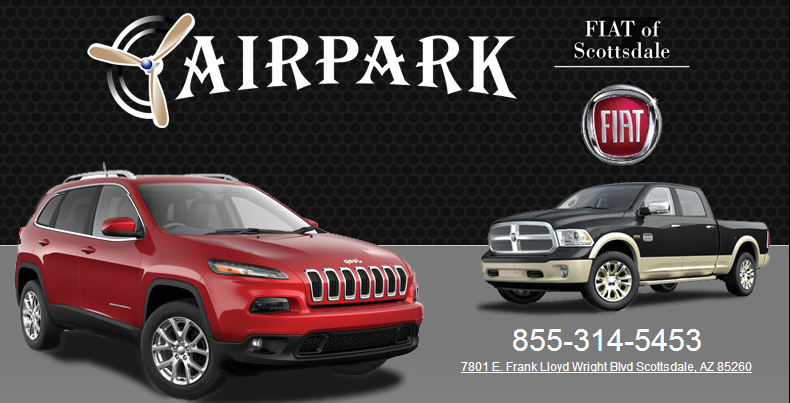 Airpark Dodge Chrysler Jeep and Fiat of Scottsdale is offering cars priced 1% below factory invoice to Employee Network discount to members AND their immediate family members. 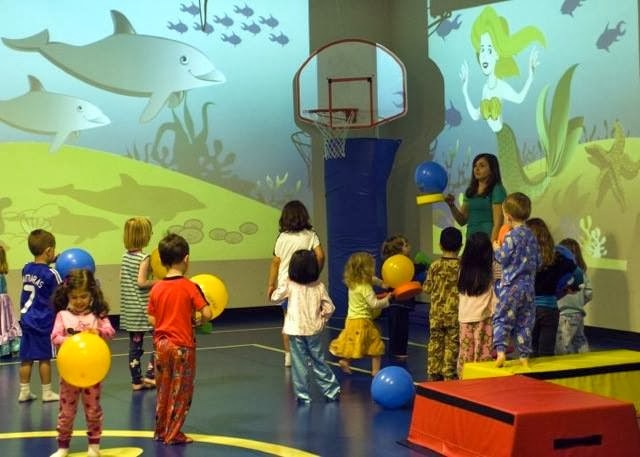 Great Play of Chandler is a unique, fun-filled activity center that strives to help kids reach their physical potential and develop a healthy, active lifestyle through a wide variety of exciting programs. Employee Network members receive 50% off class registration fee, and $30 off birthday parties. With hot summer temps around the corner, make sure your child stays active AND cool in an air-conditioned activity center like Great Play. Great Play also offers family nights, award-winning birthday parties and Parents' Night Out events. Want to reduce your air conditioning bill this summer? Arizona Blinds has an AMAZING deal going for Employee Network members... receive 25% off shutters, drapery panels, fabric vances/cornice boards, roman shades, and receive an extended 1 year in-home warranty service plus FREE in-home consultations, and FREE installations. They offer tons of other products too, so get these before summer heat sneaks up on you! 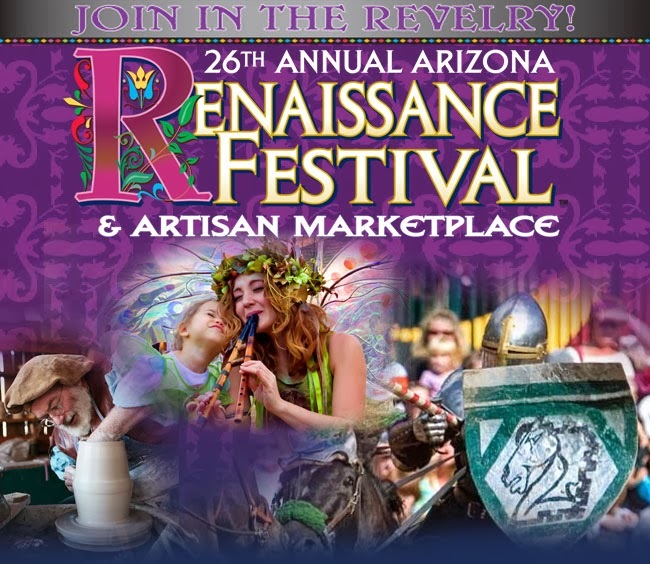 Every weekend ALL month long - The Arizona Renaissance Festival!!! Want to add your company's events to our calendar? Easy! 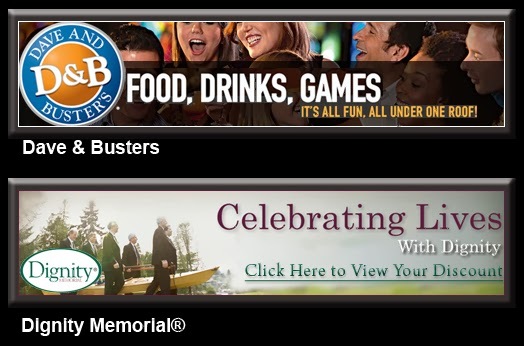 Reach out to us - call, e-mail, or message us on Facebook or Twitter to easily add your events to our featured blog posts. Did we mention it's FREE with your membership? Located inside the Paradise Valley Mall, this private practice optical business prides itself on offering superior customer service, where customers don't feel rushed and all questions and eye concerns are addressed. Employee Network members receive 30% off ANY frame in the store. Not in the market for new glasses? Click here to see their other specials on eye exams and contact lenses. Amazing Jake's has it all - lazer tag, bowling, rock climbing wall, kiddie rides, bumper cars and go-karts. With admission, you also get access to an all-you-can-eat buffet. Perfect for a birthday party or event! 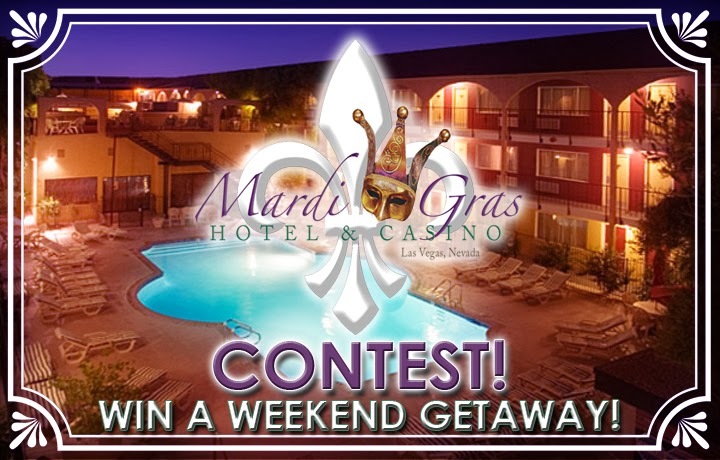 Win a 2 night getaway in a deluxe room at the Mardi Gras Hotel & Casino in Las Vegas! You will also receive $10 in free slot play plus two free drink coupons at check-in! Click here to enter. Amanda from the City of Cottonwood was our first Castles N Coasters Contest winner. Congrats Amanda! Another person still has a chance to win - Last drawing is February 19th! Single? There's a holiday for you too! Did you know that apparently "Single's Awareness Day" is an actual holiday the day AFTER Valentine's Day? Hey, couples get a day, so why can't single people? Most likely you are ecstatic because your wallet is fatter, and you can watch those weird reality shows without judgement - or maybe you are just holding out for Leonardo DiCaprio to realize you're his soulmate (like me). Either way, we think you'll enjoy these suggestions to pamper yourself and enjoy the single life. Spa day anyone? Everyone needs a massage, don't even try to deny it! We have a few spa specials all over the valley, so take your pick! Our True Rest Float Spa gift card gets you one relaxing flotation therapy session for half the retail price. Check out their website to see what a session entails. 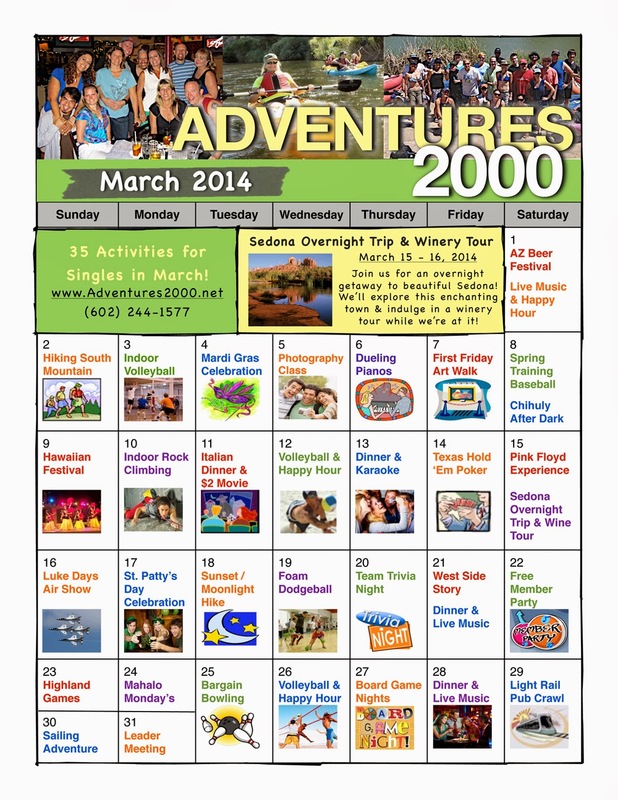 Dedicated to singles is an activity program called Adventures 2000. Don't roll your eyes yet - it's not a dating service! Wine tasting, hiking, concerts, sporting events - pretty much anything, and you have a ton of potential new friends or even special someone, if you're into that kinda thing. Best of all, they're offering a free one month membership to Employee Network members. Talk about no commitment! Pun intended. 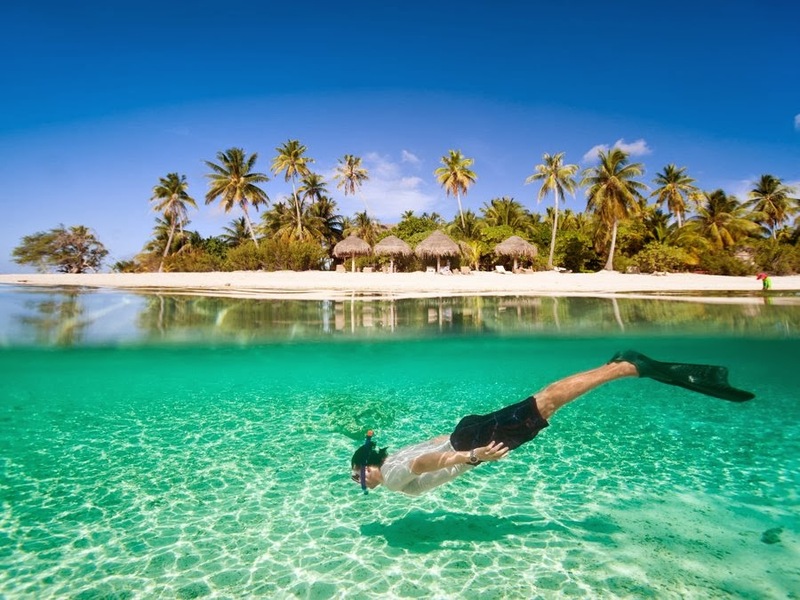 If you want to get away for a bit, Best Singles Travel is a similar service, but offers bigger products such as cruises or international vacation packages. Or maybe just try them out on a weekend trip - either way, go have some fun relaxing, doing some pre-planned stuff, and meet some new friends! Dave and Buster's Tempe Marketplace is a popular happy hour and casual dinner spot that has hundreds of exciting arcade games. The Tempe Marketplace location has multiple levels, and features an outside patio balcony perfect for enjoying the cooler Arizona winter weather. Right now, Employee Network members receive $10 worth of extra game play credits when they purchase a $10 Power Card. More deals are coming soon - go on Wednesdays to maximize your play with half-priced games! Our other new member is a long-time trusted organization for funeral services. Click here to view the discounts offered for many services by Dignity Memorial. Tosi Health offers an organic, gluten-free nutritional system designed to help you lose weight and optimize your health. Tosi offers exclusive vitamins, meals and supplements and even has an online store to order products at your convenience. Another renewed member is State Farm - Please click here to view the perks provided to Employee Network members for their insurance needs. Pssst! Don't forget - We still have one more drawing for Castles and Coasters VIP tickets. If you missed the first drawing, you'll still get another chance until February 18th. Enter today! A huge THANK YOU to all of our members and customers of The Employee Network! We would not be able to provide these awesome discounts and services without your support and involvement. More discount codes, giveaways and events coming your way! 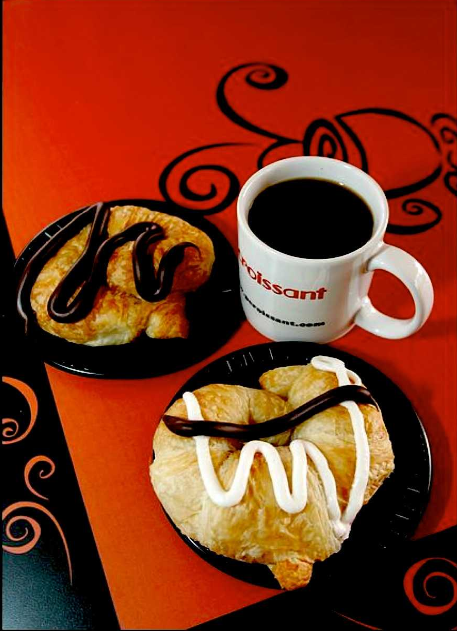 Pleaissant Croissant, also known as PCroissant, is a locally-owned bakery and brunch shop located on the North East corner of Rural and Elliott Rd. in South Tempe. Decorated with a classic French vibe, many people have discovered this little spot and fell in love. This place has a casual, comfortable ambiance and awesome service. Their croissants have received rave reviews from customers, and their prices are more than reasonable. They also offer a wide variety modern twists on their baked goods, and a ton of other products in the breakfast and lunch categories. Perfect stop during a lunch break! Here are some pictures we were drooling over (just a little...!) I think we know where we're going for lunch! Thank you for becoming a member, PCroissant! We definitely look forward to working with you. 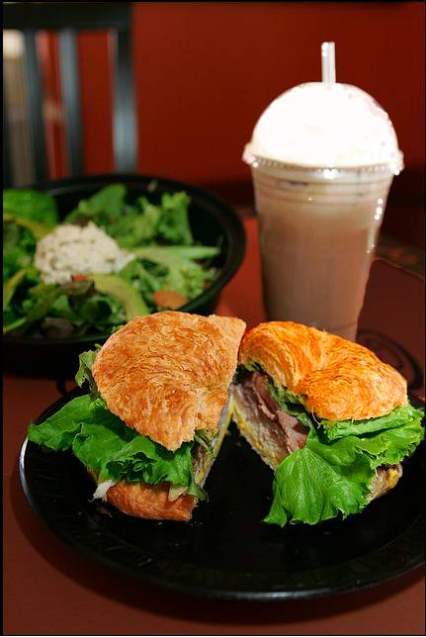 Please see our Employee Network page for a menu, as well as awesome discounts for members. Support local shops! Valentine's Day Ideas & Specials! Ah, Valentine's Day. Or as some people like to call it, Singles Awareness Day. I love Valentine's Day because of the crazy amount of chocolate in the stores. Truffles, caramels, assorted to my heart's desire. The way to my heart is definitely through chocolate. Anyone else agree? I'm actually hoping for some chocolate dipped fruit because somehow I can convince myself it's healthier. Hey, fruit is good for you! Right? It's just a little chocolate... If your significant other enjoys sweets as much as I do, Shari's Berries has a huge amount of delicious fruit and baked goods that are discounted. Check them out and try not to buy them all - I'm struggling! I've heard that SOME people in the world don't like chocolate. 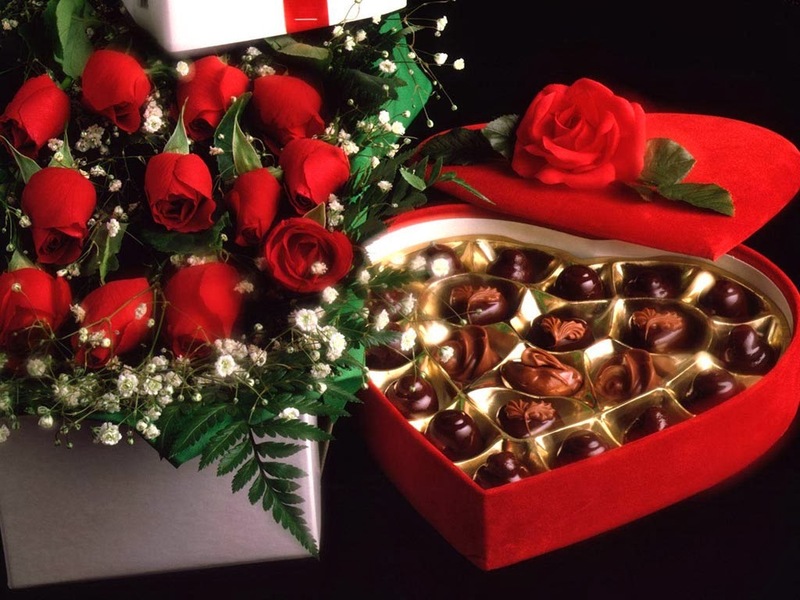 If your valentine happens to fall into this category, flowers are the obvious other classic Valentine's Day gift. A discount we have going this week for From You Flowers - 50% off Valentine's Day roses! You know, in case you haven't gotten them yet... don't worry, we won't tell on you! If she doesn't like roses, you can still get 25% off other gifts. Check out our website for the discount code. Can't think of anything to do? 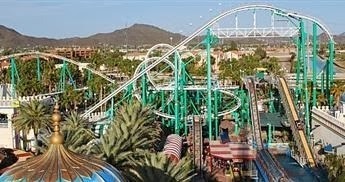 Castles N Coasters would be an awesome date. Enter to win 2 VIP tickets, along with $20 worth of Fun Cards on our website. Drawing is February 11th, so if you don't win, you still have time to plan other fun activities! Completely free to enter, you just have to be a member of the Employee Network. If you don't win and still want to go, you can purchase tickets for 25% off a VIP pass, which is unlimited rides and 18 holes of mini-golf. Another classic move - movie night! We have discounts for AMC Theaters that are valid for any date and time, and popcorn and drink vouchers. Because you shouldn't have to pay $6 for a tiny soda! You'll thank us later. Sports fans? The San Antonio Spurs vs Phoenix Suns game is February 21st. If you get the tickets ahead of time, you can totally surprise him or her on Valentine's Day with the tickets, which are TWO FOR ONE! Get them fast, though - because we only have TWO tickets left! Some other ideas: A "stay-cation" at a local hotel or resort or visit the Arizona Renaissance Festival. And of course - discounts are available for these services too! Hope you all have a fabulous Valentine's Day! Updating you on our company since our last post in 2011 (wow! ), the Employee Network has continued to grow, offering more discounts to even more companies! This week we hired our newest employee, Marissa - who's title is yet to be determined - and we have re-vamped our social media sites and decided to give our blog a new look too! What do you think? We also re-did our website and are currently still tweaking it to make it represent us and our partners in the best way possible. 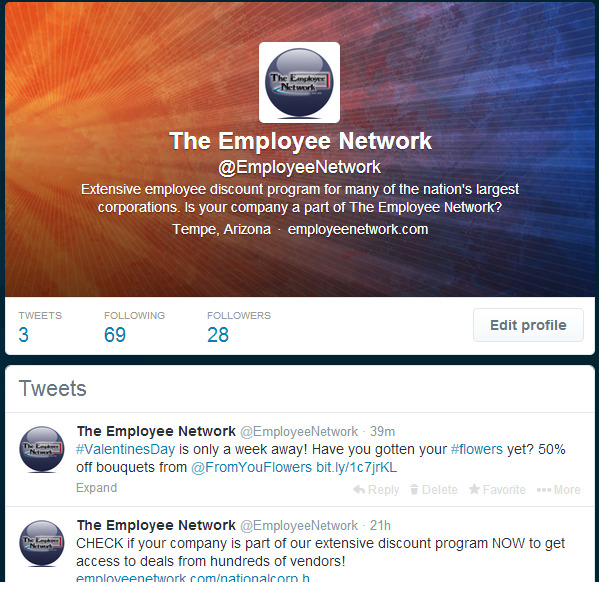 To the left is a screenshot of our new Twitter page, so FOLLOW us on there and LIKE our Facebook to get updates about exclusive offers and contests for our amazing Employee Network customers! We have a ton of events this year, as usual, so be sure to check here to see if your company is part of our 2014 Road Show calendar... if not, you should be! Maybe another BBQ is in order? Yeah, we hope so, too. For anyone who was following our blog before, just know more entertaining posts will be coming on a regular basis, with features on some of our corporate partners, multiple contributors, and more cool stuff! We just want to say thanks to all of our customers and followers, we appreciate you more than you know, and we look forward to updating you on many awesome things to come for our company and customers.